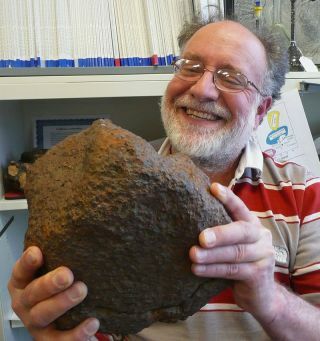 Geochemist Randy Korotev of Washington University in St. Louis holds the meteorite he helped analyze to identify its parent body. The rock was found to be a rare pallasite meteorite. Geochemist Randy Korotev of Washington University in St. Louis and his colleagues have identified the space rock as a rare type of pallasite meteorite, the researchers said today (Nov. 10). Only 19 other pallasites had ever been found in the United States before. The meteorite traveled a long road to find its way into Korotev's hands. Scientists aren't sure when the meteorite hit Earth, but it was uncovered in 2006 when a farmer, who asked to remain anonymous, found an especially heavy rock in the hillside of Conception Junction. Though the stone looked ordinary from the outside, when the farmer sawed off an edge of it, a beautiful and unusual interior was revealed. Green crystals of a mineral called olivine were sprinkled throughout an iron-nickel matrix like chocolate chips in a cookie. These are the markings of a pallasite. In 2009, Karl Aston, a St. Louis chemist and amateur meteorite hunter and collector, heard about the rock and joined with friends to buy it. To determine what kind of stone they had on their hands, the collectors brought the rock to Korotev, who was well known among meteorite enthusiasts for his website about identifying space rocks. "We wouldn't have been involved in the validation of the Conception Junction meteorite if Karl hadn't found my site," Korotev said in a statement. The scientist and meteorite lover was eager to inspect the stone, which they allowed him "to fondle briefly," he said. Karl Aston (above), the first hunter in the field, has donated a polished slice of the Conception Junction meteorite to the Earth and Planetary Sciences department. It is currently on display in the department’s museum, together with several other Missouri meteorites also donated by Aston. Korotev and his team took a sample of the rock and analyzed the elemental composition of the olivine crystals within to classify it. They found that it was part of a main group of pallasite rocks, similar to most of the other 19 that had been found in this country before. To find out whether it was a piece of a known meteorite that had already been studied, or if it was a new stone altogether, the scientists needed further tests. Korotev sent Aston and the meteorite collectors to John Wasson of UCLA, who had special tools to analyze the metal matrix the crystals were set within. Wasson concluded that the rock was unique, unrelated to any of the previous pallasites that had already been found. That qualified the meteorite for its own name. On Aug. 27, 2011, the Nomenclature Committee of the Meteoritical Society officially named the rock Conception Junction, after the location where it was found. Most meteorites are made of one type of material, but pallasites like Conception Junction are different. These stones come from large asteroids that produced enough internal heat to partially melt their insides, creating a liquid metal core and a rocky exterior. Pallasites, which contain a mixture of metal and rock, are thought to come from the boundary in an asteroid between its metal core and the olivine mineral in its middle layer, called the mantle. Asteroids are thought to be the remnants left over after planets formed in the solar system, so they are made of the same stuff as Earth. Researchers think the boundary between our own planet's core and mantle is much like the makeup of a pallasite meteorite, so they offer a unique study opportunity. Almost all the meteorites people submit to Randy Korotev turn out to be what he calls “meteorwrongs.” The meteorwrong pictured above is one of his favorites. It is actually a complex nodular concretion, probably composed of chert, and most definitely not extraterrestrial. "We can't break the Earth open," Korotev said. "We can't go down there and sample the rock, but we've got these pieces of broken asteroids that land on Earth, and they're made of the same stuff, they're just a lot smaller." When sliced and polished, the Conception Junction meteorite is worth between $30 to $50 a gram. In contrast, common meteorites sell for $2 or $3 a gram, while the first lunar meteorite found by a private collector went for $40,000 a gram, Korotev said. In all, the Conception Junction rock weighs about 37.5 pounds (17 kg), bringing its total worth to between $510,000 and $850,000, if bought outright in one piece. However, nearly 25 percent of the rock is lost in slicing and polishing, making its final value lower. Aston and the other collectors have donated most of their meteorite to universities and museums, but there are still some specimens available for purchase. Despite the high price fetched by this rock, Korotev said that meteorites are not a good get-rich quick scheme. "I don’t know any rich meteorite collectors," Korotev said. "They do it mostly for the fun." Editor's Note: This article was corrected to reflect the fact that the meteorite is worth a maximum of $850,000, not $3.4 million, following the correction of an error in the press release announcing the find.